This post is sponsored by Hill’s® Science Diet® and the BlogPaws® Pet Influencer Network™. I am being compensated for helping spread the word about the new Hill’s® Science Diet® Youthful Vitality pet food for cats and dogs over the age of 7, but Phyrra only shares information we feel is relevant to our readers. Hill’s Pet Nutrition, Inc. is not responsible for the content of this article. 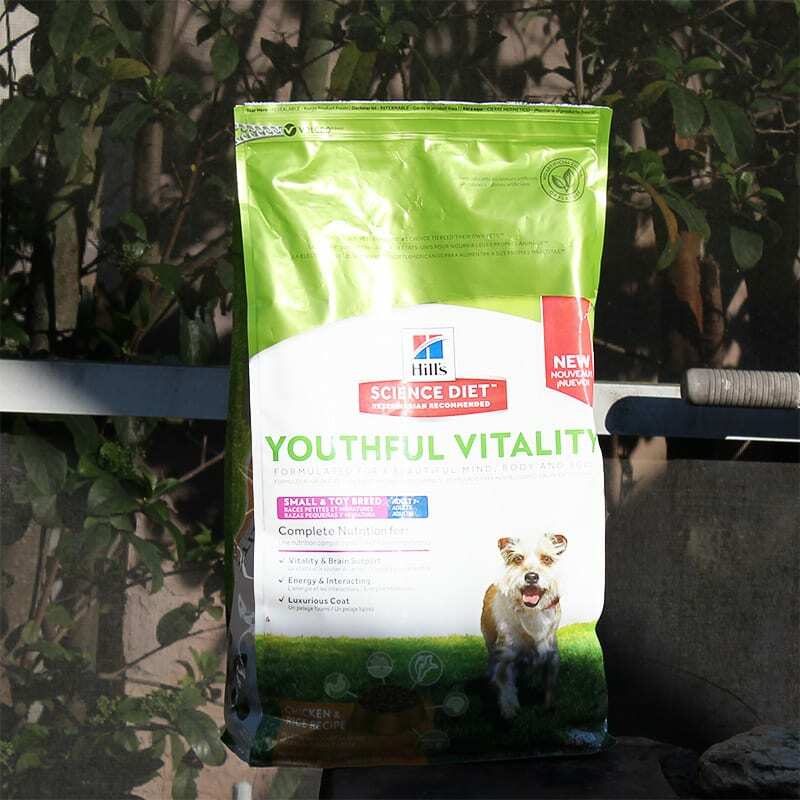 A few months ago I had the opportunity to try out the new Hill’s Science Diet Youthful Vitality for Dogs. Our pug Max is an older dog, about 16 years old. So he’s definitely getting up there in doggie years. Being a small breed dog, he can still live for many more years. I asked my vet before changing Max to Hill’s Science Diet Youthful Vitality for Small Dogs, as I wanted to make sure that it would be ok to try something new. 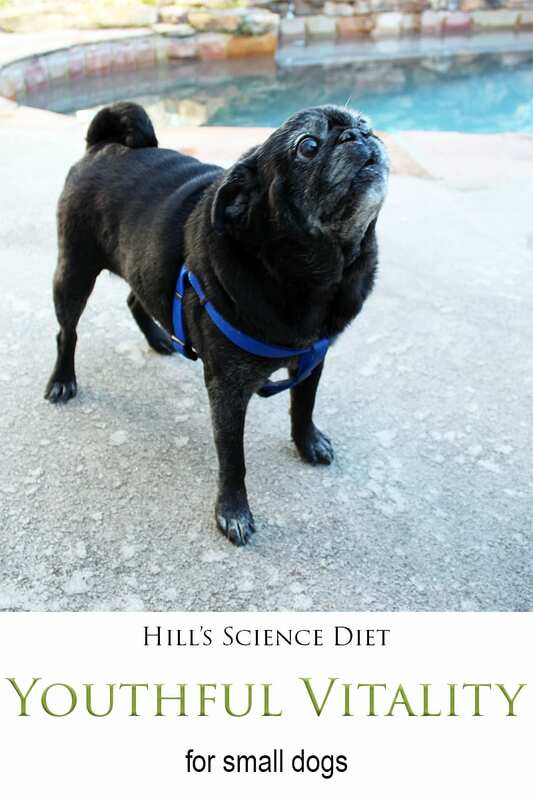 My vet carries the Hill’s Science Diet line in his office, so he said this would be a good choice for Max. Much like people, age can creep up slowly on older dogs before you realize it. Some things are easy to notice, like your senior dog’s hair turning white. Max actually has a lot of white on his face and front legs these days. While Max loves to play with Phaedra, a few months ago I realized he no longer played with toys. This made me really sad as I worried about whether or not he was still enjoying life. Some signs you can look for to help you identify that age is changing your senior dog is that they may not socialize as much as before, they may not play as much as before (like I’ve seen with Max). Older dogs may occasionally have an accident even though they’re housebroken. Senior dogs may have trouble finding their bed or they may have an unusual sleep cycle. In addition to Max no longer wanting to play with toys, I also noticed that he’s occasionally had accidents when he never did before. He’s also got a terrible, lingering cough that my vet has been treating for over a year. The cough is because of a combination of things – he’s a little overweight, he’s got an elongated soft palette, and he’s a pug. So we’re working to get him to lose weight. After about 6 weeks of feeding Hill’s Science Diet Youthful Vitality for Small Dogs to Max, I’ve noticed a few changes. 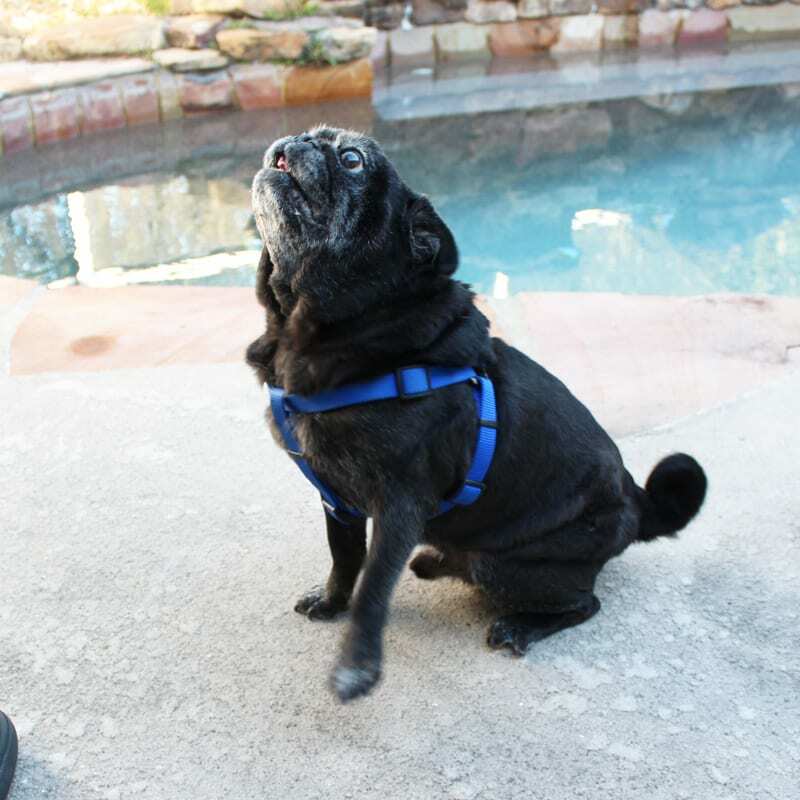 While he’s always been enthusiastic about food (have you ever met a pug that didn’t love food? ), he’s running laps around the house again after he eats. He’ll throw himself onto his bed and kick his feet into the air and wriggle his little body around like he’s having the best time of his life. I’ve been able to motivate him to play with treat toys by putting Hill’s Science Diet Youthful Vitality dog food into them. This helps him to get more exercise safely. He’s making progress towards losing weight because of his increased activity and the changes I’ve made in his diet. He’s also playing with Phaedra more frequently than before. If you have an older dog you should check out the new Hill’s Science Diet Youthful Vitality for dogs! You can save money with these coupons. Do you have a senior dog? Have you tried Hill’s Science Diet food? That is so great that Max is feeling more energetic with his new diet! He’s so cute!! Max is so cute! Sounds like a great formula to try out. We have three pups but we haven’t tried this food yet. We’ll have to check it out. Max is such a cutie!!! This posts provides great information about aging in our doggy family members! So glad to see Max perked up. Being a pet parent is so scary. Science diet’s specialty formulas have extended the happy lifespan of a few of my pets and I highly recommend. Max is so cute! I’m happy this food is helpful feeling a little more youthful. Hunter also does that kicking the air thing. It’s so funny! Our 8 year old tripod rescue is 8 years old and is on Hill’s ID for her sensitive stomach. Will definitely talk to the vet about this combination as she ages. Thanks for a great review..
Aaawww! Max. I’m glad that his new food is helping him to feel better and be happier and more active. Max!! So glad this is helping him feel younger and more energetic! My Eddie is getting up there, I think he’s about 14 (he’s a rescue, I don’t know his exact age, but I’ve had him nearly 10 years). I’ve noticed in the last few months that he’s slowed down, isn’t playing as much, and is sleeping a lot more. I well research to see if this is a good option for him, though I have to watch his fat intake as he has a history of pancreatitis. I adore pugs. I really hope Max gets better soon! Awww I’m so glad he’s energetic again! It’s so sad to watch our pups age. Great info .. I already feed both my dog (8) and cat(10) Hill’s but will definitely look into the formula Phyrra and Max are using! It’s one my vet recommends. When I had cats, my cats were on Hill’s Science Diet too. Yeah treat toys are good for getting them to exercise and be entertained. Though one of the treat toys is a puzzle where you move things with your nose or mouth to open them to get the treats out. His solution was to pick up the toy and slam it on the ground until it broke and the food popped out.